He retired in 2014, but old habits are hard to break. 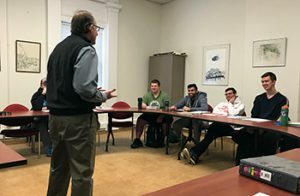 The Emeritus Professor of English can be found instructing yet another edition of Wabash men in Business and Technical Writing, a class he started on campus and taught for more than 30 years. 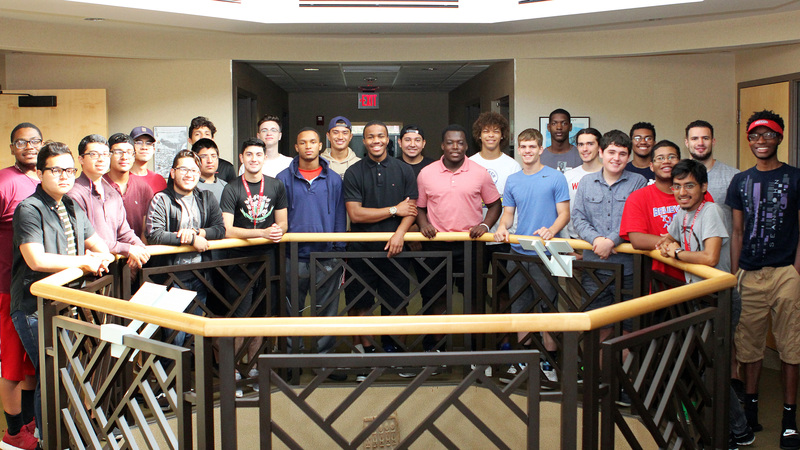 Tobey Herzog H’11 with his Business and Technical Writing students. That experience makes him comfortable with the subject matter, but he had concerns about the students. Had they changed? For him, it was different. With only one class to teach, time became an ally. It opened up ways for him to think about the class in different and deeper ways. The students are noticing, too. On this day, the discussion initially centered on what was learned from previous assignments and how to move forward. With a feasibility study and product development launch ahead, the lesson was clear: from this point forward, it’s time to apply what you’ve learned. 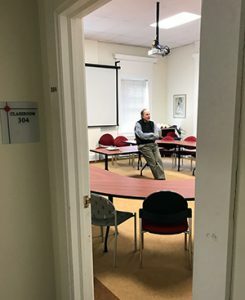 Herzog awaits the start of class. As a business minor, this class is one of Sandhu’s requirements, but he had other goals in mind as well. Like many retirees, Herzog’s concerns also addressed his own relevance. The shared experience seems like a win-win for everyone in that classroom. Over Thanksgiving Break, art major Marlon Lewis ’20 went on his first immersion trip to Prague, Czech Republic to hand carve puppets with his Theater 303 class. In January, he will be leaving for South Africa for a semester-long study abroad program. We sat down with Lewis to hear about his immersion experience and learn more about the Chicago-native’s desire to travel. Q: For starters, why puppets? And why Prague? What’s the connection there? A: Our Theater 303 class spent the entire semester learning about Czech puppetry – it’s super connected to their culture. Puppetry has been around for a really long time. When the Czech Republic was under Habsburg rule, German was considered the official language of state, and Czech language and culture was suppressed. The traveling puppeteers continued to perform in Czech and helped the language survive through puppet shows. Over time, puppets have become a symbol to the country. We went there specifically to make our own puppets with professional puppeteers. 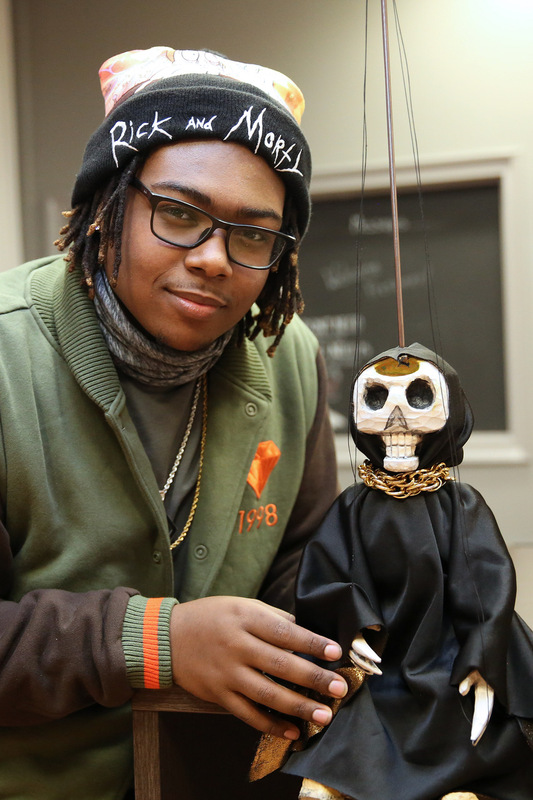 Over the semester, we designed our puppets, sent them out to the workshop, and got feedback from the puppet masters. Q: Before your trip to Prague, had you ever been out of the country before? A: No! I hadn’t even been on a plane for longer than two hours! When I came to Wabash from Chicago, I didn’t even think of leaving the country. I never thought I’d be in Prague, making a puppet. That was so surreal, yet I didn’t feel out of place. I could tell I was somewhere new, but it felt normal. I jumped right in and did my thing. A: I was nervous about getting lost. Not being able to talk to anybody. I didn’t know enough Czech to get by at all. I could wake up and say, “Good morning.” I could say, “Good day.” And I could say, “Thank you.” But I was also really looking forward to experiencing something that wasn’t American. I wanted to see a different perspective. Q: What was the shop like where all of you worked? A: People spend their entire life in puppetry and never get the chance to be in the shop where we worked. That shop has a waiting list! When I heard that, I was like, “Dang!” We really felt special. And all I could think about was thanking Wabash for using my tuition in a way that I never would have thought of. 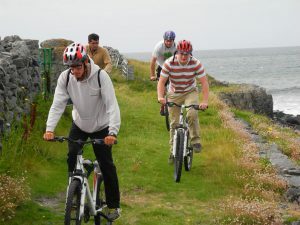 Q: How much of the trip did you spend working, and how often did you get to explore? A: We went over there to do a job. We worked about 40 hours in the shop that week, so it felt like we were workers—not tourists. After our second day, I was wishing that we had the morning to go out and do stuff. To see things in the light. But then I realized that everyone else in the city is doing their job or going to school, so I wasn’t in broad daylight embarrassing myself, trying to figure out where to go! 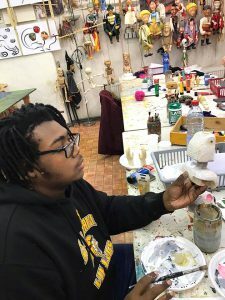 Q: How different did it feel making a puppet in a workshop in Prague compared to something you create in one of your art classes? A: It wasn’t a classroom. They were instructing you, but you were on your own. Even though we got a grade on what we made, it wasn’t a studio class where I felt like I was making it for the grade. I really felt like I was making it for me. The puppeteer we were working with is probably in the top five of all time. He brought in a top-10 master carver, who brought in another. To learn under them, to see their abilities, even though it was just for a few days, it was invaluable. Especially since I make art all the time. They taught me thought patterns that I’ll hold onto forever. Q: How did you decide what type of puppet to make? A: My puppet is a skeleton. At the beginning of class, we had to choose a Czech person to model our puppet after, and the guy I chose was from the 1800s. He was commissioned by a church to store and organize the bones. So it was like, “What could I do with you?” I’m kind of into the macabre thing. The beauty of it – making it beautiful. I can find positives in almost anything, so I thought I could make something really nice out of this. So my skeleton is the protector of the ossuary (a room in which the bones of dead people are placed). My original idea was just a huge head. Arms and legs hanging out of the head – I didn’t want a torso or anything. But when I sent that out, the master carver said it would be too difficult for my first puppet. (laughs) Now my puppet is in a black lining with gold lining and a gold chain. Q: When you did get to explore, what was Prague like? A: Prague, at least the parts we were in, wasn’t modern at all. They still have cobblestone roads. Most of what we walked on was cobblestone. Anthony (Williams ’20) and I found maybe two or three roads that were paved. It’s such an old city compared to Chicago. The structure of the buildings felt similar with the ground level of the buildings being a shop and then people living on top – I see that all the time back home. But there’s really no space between the buildings. We barely have space between our houses back home. People in Indy are always like, “Why are the houses in Chicago so close?” In Prague, you couldn’t even walk between most of the buildings! Q: Speaking of homes, we heard you all were able to meet with three alums who live in Prague! A: Oh yeah, I was like, “What the heck?” I didn’t even know where Prague was before this class, and there were three! 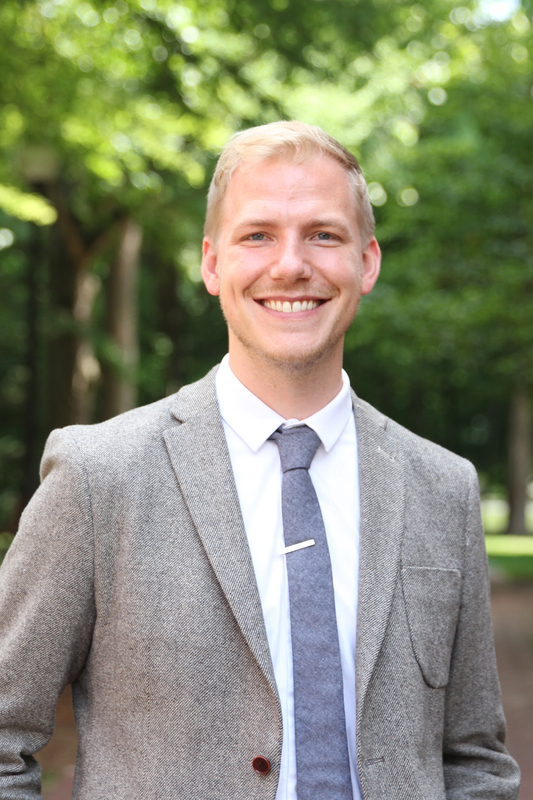 One alum has been out there going on eight years, and he left the day after his graduation. He initially was working with a church program, and now he works with a monastery. He’s also a football coach for the national Czech football team. Another is an English teacher, and he’s been out there for 3 years. They each gave us their own tour of the city, so that was nice. It’s always fun to meet Wabash guys. We just all connect so easily. 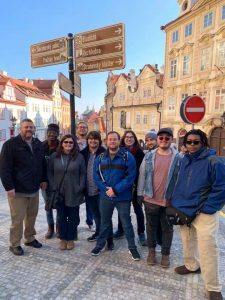 It was crazy to learn that there are people who know what we go through and people who have had similar experiences and are now living in Prague. If I ever want to come back, I know people here! Q: Now that you’re back, you’re preparing to leave again. How are you feeling as you get ready to study in South Africa for a semester? A: I honestly can’t wait. I’m so excited for it. That’s really why I was so glad to be part of this class. I was about to be gone for half a year, and I hadn’t even been out of the country for a day! I had no idea what that was going to be like. This trip helped me understand the mindset I’ll have to have as I travel and gave me an idea of some of the challenges I’ll face. My goal after college is to travel, meet people, and help them better understand each other. Help people become more connected. Whenever anyone asks what I want to do, I always say, “Save the world.” But I have to explore it first. 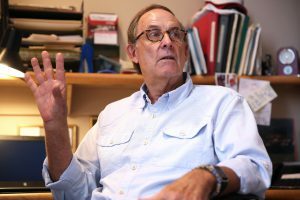 Richard Paige — The goal behind WABASH Day was never self-serving. Sure, there would be meaningful service – 16 projects that dotted Crawfordsville and Central Indiana as well as six others spread nationally from Washington, DC, to Denver to Dallas – but the goal was always something bigger. 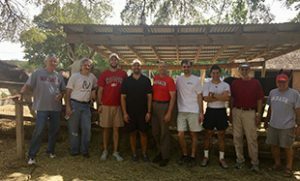 Yes, after 14 years, WABASH Day (Wabash Alumni Benefiting And Serving Humanity) continues to meet the challenge of improving communities and fostering camaraderie. George Vinihakis ’15, of Orland Park, IL, captained the Wabash Club of Chicago’s efforts to clean up a Chicago-area beach. Working through the adopt a beach program, Wabash alumni gathered at the 12th Street Beach and collected nearly 50 pounds of trash from the lakeshore. The alumni group in Dallas, Texas. Camaraderie is the lasting effect. 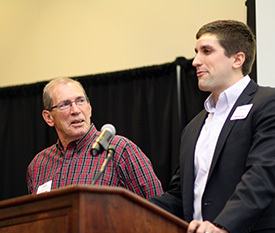 Lange feels a strong byproduct of the endeavor is to get to know his fellow Wabash grads a bit better. 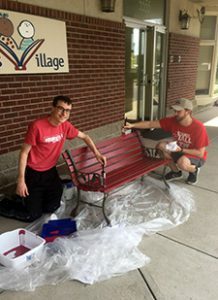 Classmates Patrick Bryant ’16 (left) and Grant Benefiel ’16 volunteer at The Villages. There is value, too, in the assistance, as can be seen in the work that Kevin Benefiel ’81 and his family have championed at The Villages, a provider of foster care, adoption, child care, and early childhood development services in Indianapolis. This was the 14th consecutive year Benefiel and his family — wife Julie, and sons Ty ’08 and Grant ’16 – have completed projects at The Villages, ranging from painting interior walls to spreading mulch throughout the playground to painting and staining the playground equipment. In that span, WABASH Day efforts have helped The Villages save thousands of dollars. Pactor, a regular contributor at The Villages, remembered that one year a staff member said they spread so much mulch that it saved the agency enough money to fuel their bus for an entire year. The win-win proposition of WABASH Day also resonates with group leaders like Lange. Richard Paige — It was originally intended to be more dramatic. A change of direction just a week before curtain left the Gentlemen Callers back at square one. At least they had a title. What came to life in a mere four days was something far more humorous. A smart, self-aware, and hilarious comedy about the unintended consequences of technology loosely based on collegiate experiences was the result for IndyFringe festival audiences. 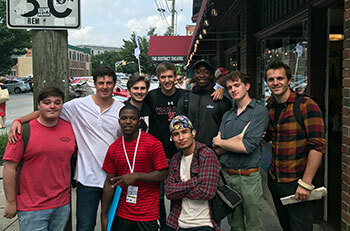 The Gentlemen Callers (l to r): Austin Yeomans ’20, Luke Wallace ’21, Ahmaud Hill ’21, Austin Ridley ’20, Quinn Cavin ’19, Chris Diaz ’19, Ra’Shawn Jones ’20, Louis Sinn ’19, and director Patrick Kvachkoff ’15. The skit depended upon a carefree tune, and Diaz originally picked a song that he knew the lyrics to, but the group decided that audiences wouldn’t understand the song or the reference. So he picked one that everyone knew…”a friendly song,” says Diaz. For Kvachkoff, an actor carving out his niche in Chicago, such creative focus was the most rewarding part of assisting with the project. Through the Callers’ run at IndyFringe, Diaz admitted to nerves, especially in the first few shows, but credits Kvachkoff with helping him work through that. A member of the first Wabash Gentlemen Callers troupe that first performed at IndyFringe in 2014, Kvachkoff said his job in this incarnation was simply facilitation…to make sure it happened. It was about editing and helping them put on the best and most stageable show they could. And it made the commute from Chicago worthwhile. Welcoming new international students to campus. 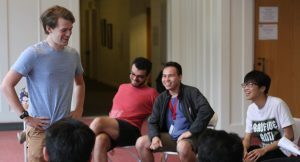 Brady Gossett ’19 — Director of International Programs Amy Weir welcomed a new group of international students to campus Monday, tending to all the little details to ensure their transitions was smooth. Any travel is draining enough, but many of these students are coming off long flights across several time zones. Weir’s focus then becomes getting the students acclimated to life in the US and life at Wabash. Along with the time difference, there are a lot of other cultural differences that affect new international students. 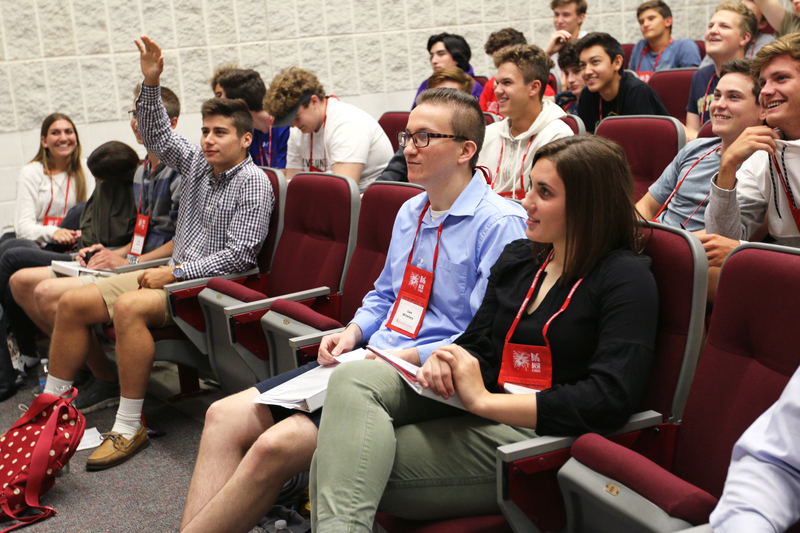 Weir works tirelessly orienting students to Wabash prior to the beginning of classes. Activities include meeting with various faculty and staff, campus scavenger hunts, discussing immigration rules, and lots of icebreakers. In one particular ice breaker, Never Have I Ever, students shared experiences with each other in a race to find an open chair. Lots of laughing, joking around, and jockeying for seats. I finished up taking photos and joined the game. After the first couple “Never Have I Ever’s”, I think they noticed I hadn’t moved from my seat. More laughter as the student mentors and I scrambled to grab a seat. That was a good one, I thought. They’ll fit in just fine here at Wabash. Richard Paige — The text came out of nowhere on a random January day. The show in question was “I, Nephi: A Gay Mormon’s Survival Guide,” a one-man play that tells the true story of a man reconciling the world of his family with the culture of his sexuality. Originally conceived and written by Joe Mount ’15 for his senior capstone project, I, Nephi, had only seen the light of day as a staged reading in the Spring of 2015. And if Mount had his way, that’s where things would have stayed…until that message was received nearly two years later. Rory Willats ’17 was just the guy to make it happen. 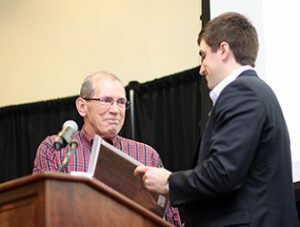 He and Joe had been friends largely from the time Rory arrived on campus and collaborated on a number of Wabash productions and developed a deep well of trust with each other. Joe claims that level of trust was vital to bringing his thoughts to life. He says Rory knew well of the backstory, of Joe’s struggles with his family, and his hesitancy to take the play further. Such descriptors don’t surprise Wabash Theater Department Chair Jim Cherry. Trust is foundational to good theater. 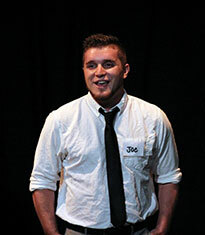 Even in the middle of a successful six-night run at the Phoenix Theater during the 2017 IndyFringe Festival, Joe still felt those pangs of terror in that the show was staged at the festival and not the more familiar confines of the Wabash Theater. What Joe needed was someone to help him work through the emotional moments, the parts of the story he still struggles with, to objectively move the play forward. 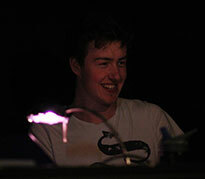 Rory Willats ’17 in the Phoenix Theater control booth. “I needed somebody slightly separated, not as invested, that could say, ‘Well this is what you are feeling and this is what you want to get across, so this is the way to do it,’ or, ‘What you’re doing right now is not going to be as effective,’” he says. From that initial text, the two started piecing things together in June. Three weeks of rehearsals led into opening night. Rory reflected on how the theater connects people in ways where heartfelt stories are the result. Joe thought living and writing the story were enough. Thanks to his friend and collaborator, he got much more in return. Matchmaking and marriages. Children and grandchildren. 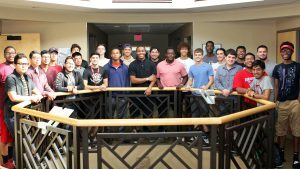 Tobey Herzog has seen it all during his time with OLAB, the Opportunities to Learn About Business summer program, and that’s just from his own family! 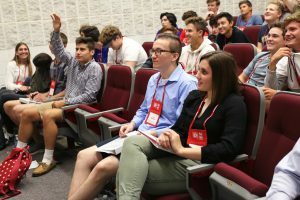 OLAB is a one-week hands-on introduction to business and the market economy for young women and men entering their senior year in high school. Now in its 46th consecutive year at Wabash, the program’s success is known nationwide. In 1978, Tobey began his time as an OLAB instructor teaching about writing job applications. He later taught advertising and marketing and worked with OLAB until 2010. OLAB marketing campaigns featuring children often included Tobey’s then young sons, Rob and Joe. And when they were both old enough, Rob and Joe went from the instructor’s kids to participants to OLAB counselors. Joe’s wife, Marci, also went through OLAB. Then there’s Rob’s wife, Beth. She didn’t attend OLAB as a high school student, but her connection to the program makes this family’s story even more interesting. Rob was living in Washington D.C. and studying at Georgetown, when he came home one weekend for a wedding. That evening, he had plans to reconnect with his former OLAB counselor Greg Shaheen, who has now worked with OLAB in various capacities for more than 30 years. At that, Greg made Rob change their original plans and drove him up to Culver, Indiana, where Beth was working at her relatives’ root beer stand. OLAB was two weeks away, and the program was short a female counselor that year. “So I hired Beth on the spot,” Greg said. Tobey had no idea he was working with his future daughter-in-law that week, but he said that week allowed him to see how great she is. Rob and Beth later married, and – of course – Greg was in their wedding. Now their oldest daughter, Mia, is participating in OLAB this week. “And they owe it all to me,” Greg laughed.